The American Mental Health System is in a state of perpetual negligence! It has been for years! I am sure you will agree with me. Over three hundred and fifty thousand ill human beings suffering from psychiatric medical conditions are languishing in jails and prisons across the country because they did not get the appropriate medical care and treatment they deserved! These very sick people are someone’s daughter, son, brother, sister, grandchild, friend, etc. This is inhumane and more than unacceptable! I am a father whose son is in prison. I am not alone. So, I documented our experiences trying to get help and wrote a book: Christopher’s Story. An Indictment of the American Mental Health System. The mental health system failed us over and over again. Chris was adopted at age three in 1986. He had been physically-abused and had multiple problems. Our family knew we had the skills and the love to nurture Chris to thrive as an adult. That’s what every parent wants for their kid, right? I was a high school counselor, so I knew parenting skills and love wouldn’t be enough. The mental health system would have to be utilized to help Chris become a well-adjusted man. Willing and ready to send Chris to whatever professional was needed to help him succeed, we didn’t know was many of the people we needed to help us were unwilling and/or unable to help. We saw our little boy enter a downward spiral that no mental health professional stopped until the worse thing in the world happened. On August 28, 2006 at 9 PM, I received “the call.” I always knew one day I would get “the call.” But I always thought it would be from someone telling me my son Christopher was dead or near dead. Instead it was from twenty-three year old Chris. Crying and difficult to understand, he was in Strafford County Prison in New Hampshire. At age thirteen I learned, for the first time, that Chris had brain damage the size of a golf ball from his mother’s use of drugs and alcohol during pregnancy. No one ever told me he had fetal alcohol syndrome (FAS), but he does! They should have known this because FAS has been around since 1975. Finding this out was a heart-wrenching moment: learning even after so many years his abusive parents still seemed to have a grip on him. So, for 13 years Chris did not get the treatment and interventions he needed for his condition. Instead he was shoved around from mental health provider to mental health provider, put on numerous different medications that didn’t work, and his need for behavior modification and developmental supports was never met. However, this new understanding and new perspective did give me hope. I thought this would enable the medical professionals to pinpoint an effective manner of treatment for Chris going forward. I was wrong! The perpetual negligence of the American mental health system continued. The same old ineffective methods were tried and the “professionals” and “agencies” often seemed more concerned about making money than helping him. Raising Christopher was a series of diminishing expectations: He’ll go to college! He can enlist in the military! He can go to Vo-Tech. Maybe we can get him through high school. Something bad is going to happen. A friend once said the only people that are more reviled than my son are the guys who flew the planes into the World Trade Center. To understand the heartache caused by the negligence of those who are getting paid by health insurers and others to provide optimal care purchase and read the book: Christopher’s Story. An Indictment of the American Mental Health System. It is available via Amazon, Barnes & Noble, and Walmart. 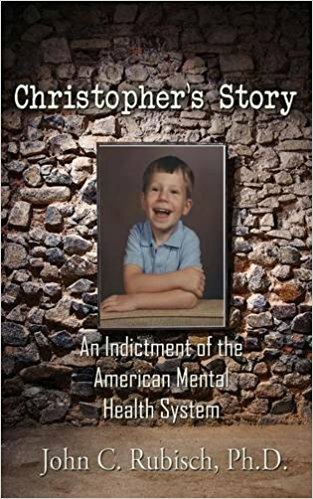 It is my hope Christopher’s Story will shed light not only on the downfalls of our current mental health system, but also on how to right these wrongs. I ask you to stand with me to make a difference in the lives of our most vulnerable. Together, we can make improvements so another child like my son Christopher never falls through the cracks again. First, go to www.americanmentalwellness.org/champions and sign on as a “Champion for Prevention, Early Intervention, Scientific Research, and Cures of mental health problems. Being a Champion is free and easy, and it unifies everyone wanting improvements in our country’s mental health care. Then, contact your elected officials. We need to see positive change now! Our story is not unique – hundreds of thousands of people are suffering. It’s time our state and federal government officials work to end this inhumane situation. Contact your elected official by visiting www.usa.gov/elected-officials.